Watch Your Favorite Transformers Come to Life! 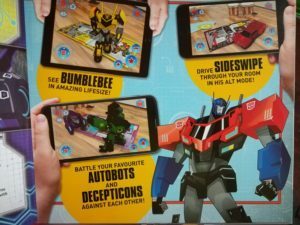 Do your kids love watching Transformers in Disguise on TV? I’m sure you’ve also spent hours pretending that you were Autobots fighting the Decepticons. I’m guessing most of the time you get to be the Decepticon, too. If your kids are great fans, I’m sure they have wished many times over that the Autobots were real. Here’s some great news! 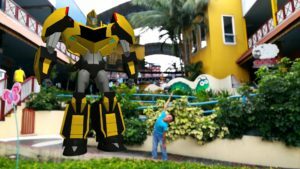 Aside from watching them on television, you can now actually watch Transformers come to life as never before! 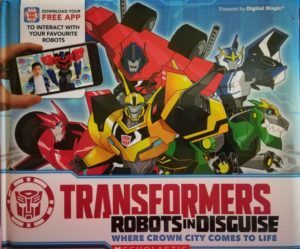 Not on the big screen but in your own home through Scholastic’s Augmented Reality book Transformers Robot in Disguise: Where Crown City Comes to Life. 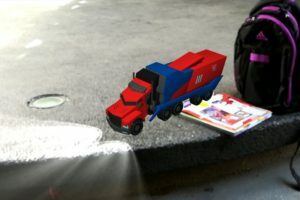 My son Jakei likes watching Transformers Robots in Disguise on Netflix so he was very excited when he saw the book. While waiting for me to download the app, he already became so engrossed in reading the book. It actually doubles as a character guidebook for the animated series. It starts with a brief intro about how the Transformers came to planet Earth. 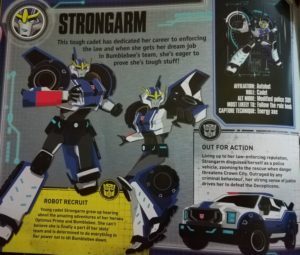 Then there are descriptions and fun trivia about all the featured Autobots and Decepticons. With the app, Jakei can make the robots walk and drive around. It’s really cool to watch them transform from vehicles to robots. 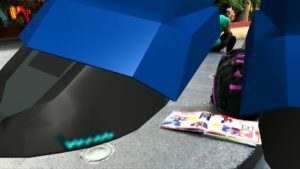 When the robots are in lifesize, they even leave cracks on the ground when they walk! The kids and I also enjoy taking pictures with life-sized Transformers. We did kinda look weird taking pictures outside (because you can’t very well fit a life-size Transformer inside our house!) but it’s really cool to see pictures of us with life-sized robots. 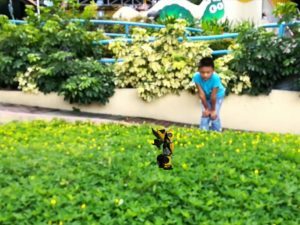 The app also helps develop kids’ creativity as there is a feature that allows them to create their very own robots. There’s another feature in the app that we haven’t tried yet. Friends can actually play together in the Battle Mode. 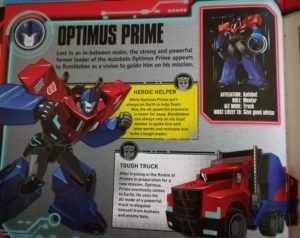 They get to choose their own Autobots and Decepticons and engage head-to-head in a battle. All they need to do is to download the apps in their devices and connect the devices to each other. If they don’t wish to battle it out, they can just choose Transformers from the same team and make them walk around together. The kids love this book because they get to use the tablet! LOL! Aside from that, they get to do so many things with different robots. They can also play together even while using gadgets. 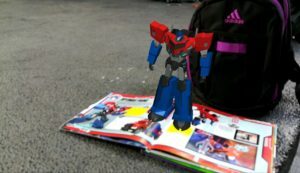 When gadget-time is over, they still get to enjoy reading the book and learning more about the Autobots and Decepticons. They actually know more about the characters now than I do. Not only kids will love this book as I myself enjoy reading the book and using the app. This is surely another book that will stay in our collection for years.